Download the Turnaround program and get started today! The Digital Program is a great option for international buyers and for children in crisis who need help ASAP. Thousands of programs have been downloaded and shipped since 2010 – Read what our happy customers have to say. The 10 Part Turnaround Program for your child (all audio files in .MP3 format). 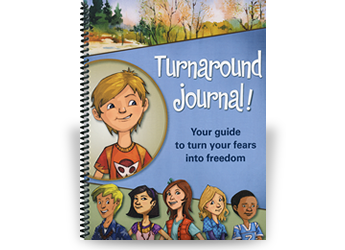 The Turnaround Journal (Workbook in .PDF format for you to print out). The Parent Guide- resource for parents. The Chill Kit- relaxation exercises. If you want you can also purchase turnaround as a physical product or premium (which includes both digital and physical products). 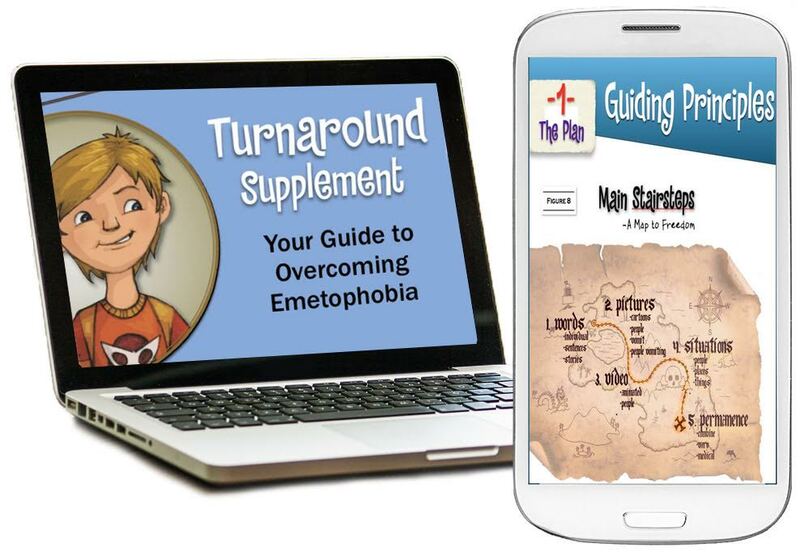 Download the Turnaround program and get started today! The Digital Version is a great option for international buyers and for children in crisis who need help ASAP. It includes everything in the other versions except the interview with the neuropsychiatrist. The 10 Part Turnaround Program for your child (all audio files in MP3 format). The Turnaround Journal (Workbook in PDF format for you to print out). The Parent Guide – resource for parents. The Chill Kit – relaxation exercises. Listen to this EXTENDED explanation of Turnaround with samples from the program. For directions to download on Apple devices please refer to frequently asked questions under technical questions. If you have any problems ordering, please contact us at 877-300-7436 or email us at sales@turnaroundanxiety.com. 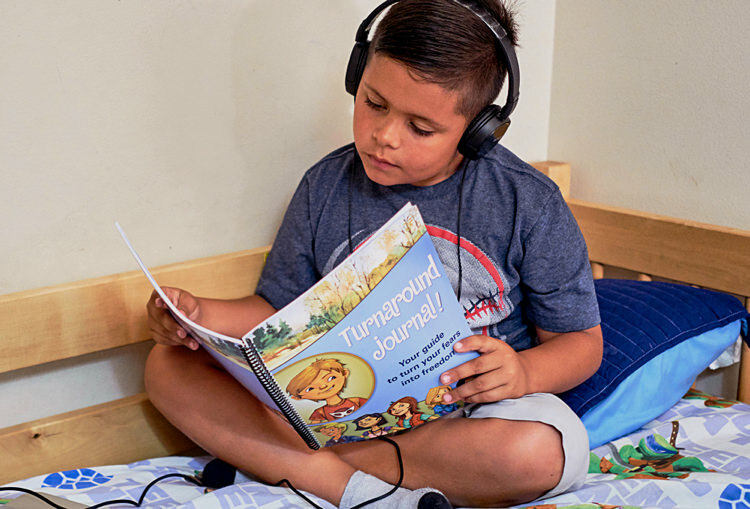 You can visit our Customer Testimonials Page for hundreds of reviews from happy parents and children you have used the Turnaround program. Hello, I purchased the Turnaround audio series for my 12-year-old daughter and I can’t thank you enough. She is off of the prescribed ADHD medicine and has brought her grades up from D’s & F’s to C+’s, B’s and an occasional A! She is so confident now that she understands how to process fear. I sincerely believe that your program saved her from a lifetime of pill popping and disappointment, we intend to draft a sterling letter of support for your website by the way 🙂 -M.M. 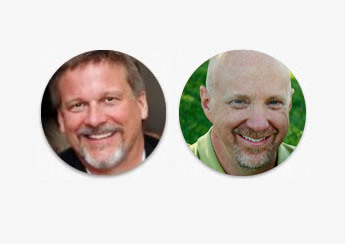 Dear Dr. Chris and Dr. David, Hi! My name is (blank for privacy), and believe it or not, I have a little issue from every camper, but I’m probably most like Jordan. I have very severe panic attacks. They are VERY SCARY! But with the help of Turnaround, a little medicine, and lots of support from friends and family, I am almost better! 🙂 Before any of that, I would talk to my pets. Mostly, Lilly, my 12-year-old cat who has grown up with me. I am 11 1/2. She is the most special thing to me. She understands me. She also has some shy and severe worry problems! She trusts me more than anyone in our family. You probably get how much I love Lilly, well, I love Turnaround as much as I love her! Than you sooooo much! So much that I can’t even write down how much!! I am finally going to school without me crying. God bless you both. -transcription of letter from young listener with an awesome cat. 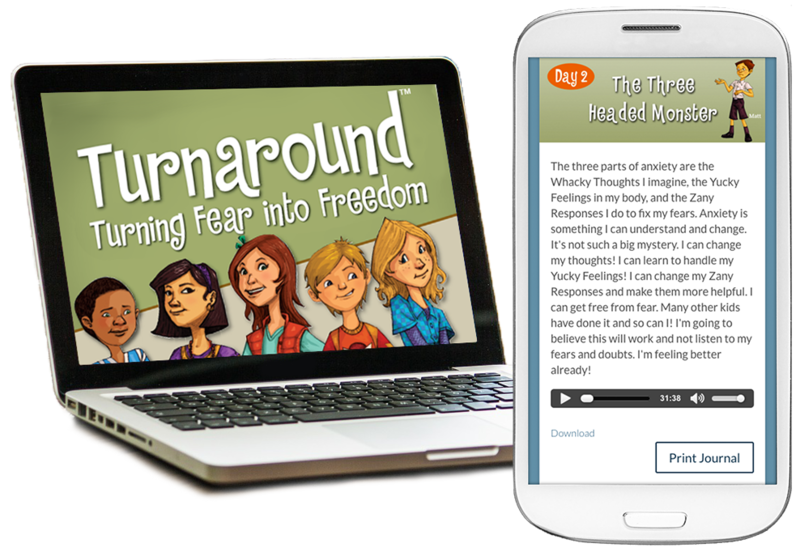 As a mother of two kids and as an anxiety-sufferer myself, I highly recommend the program Turnaround: Turning Fear into Freedom. Its creators, Dr. Russ and Chris McCarthy, have managed to get inside the heads of little kids. In my experience, top notch doctors and specialists may have first rate information, but it is more often than not lost in the delivery to children, especially children who are flooded with fear. Turnaround definitely captures the inner world of children, both boys and girls. It also represents a range of anxieties (each of six child characters represents a different anxiety). In so many ways, this frees the parent from having to be their child’s therapist, or from being a translator and mediator between a doctor and their child. I cannot say enough about the benefits there! And as an anxiety sufferer myself, I can say that this program is packed to the brim with excellent content. The tools and concepts are couched in a child’s vocabulary, yet represent cures for anxiety that have led to freedom in my own life from panic attacks and phobia. There is undoubtedly sound science behind this program. I want to thank you so much for the journal and to let you know that your program is wonderful. We worked the program with our little girl and it did wonders in helping her overcome her anxieties. It took a few weeks with working on the journal in the day and listening to the cd’s at night but she got past her fears and has no problems going to sleep anymore. I have recommended your program to many of the people I know that have foster kids that have been through trauma or as my child, have been exposed to drugs in utero. Thanks again so much. I strongly thank you for making Turnaround. It really helped me turn my fear into freedom. At the end of Day 10 I cried tears of joy. I am 8 and 3/4 years old. I had a lot of anxiety about having anxiety because of a panic attack I had during the night. My favorite disc is Day 9, “Grace Learns to Trust.” I like the story of Grace and Pilgrim. It also helped me learn what Stairstepping is like. Once again, thanks for making Turnaround! I am now free from my fears and would like to meet you someday. My daughter, age 11, is a “special needs child” with spina bifida. She is very mobile, very smart, and hyperactive. She has had many surgeries and has been on quite a bit of medication, and had developed a great deal of anxiety. I did not want to medicate her even more for the anxiety, and I was praying about what to do. I found Turnaround through YouTube and called to find out more about it. We received the kit and she truly loved it, listening faithfully every morning, working through journal, and listening to the Chill Kit every evening. After several weeks, she only started listening to the Chill Kit at night. Soon, she stopped that as well. The anxiety dramatically diminished to the point that she was able to go to a vacation bible school and an art day camp all without me! She had one panic attack, at the beginning of bible school, but was able to talk herself back into control. She has been able to come off all but one of her meds! She still doesn’t enjoy going shopping, but she will go…a major change. Truly, a TURNAROUND! I am thankful for the kit, and for the progress that she has made. I have faith that now, with the knowledge that she has received, she will improve even more. You can also visit our Customer Testimonials Page for hundreds of reviews from happy parents and children you have used the Turnaround program.